More than 80 Adivasis file complaints of their land being snatched away. What next? Pavitri Manjhi, a tribal woman from Khokhroama village in Raigarh district, North Chhattisgarh, has alleged that her six acres of land was forcefully acquired by a TRN Energy, a subsidiary of ACB India Power Limited, in 2009, 2010 and 2011. “My land was acquired by TRN by force, against my will,” said Manjhi while talking to Catch over the phone from Raipur where she addressed a press conference on Thursday afternoon. The press conference was organised by the victims of the alleged forced land acquisition and activists working on the issue. “When I protested the acquisition, I was threatened by the company goons,” she added. And she is not alone. There are hundreds of Adivasis in the district who have faced similar situations. On Wednesday (14 June), more than 80 Adivasis from different villages across the district filed mass criminal complaints at the Scheduled Castes and Scheduled Tribes Welfare Special Police Station in Raigarh. They alleged that they had been forced into selling their land. In their complaints, they have used the newly added provisions in the Scheduled Castes (SC) and Scheduled Tribes (ST) Prevention of Atrocities Act which criminalises the wrongful dispossession or interference with the lands belonging to the SCs and STs. Though the act was originally legislated in 1989, in January last year the Parliament passed an amendment to the Act. This amendment, among other things, inserted an explainer stating that the word “wrongfully” included dispossession or interference done “without the person’s consent”, or “with the person’s consent where such consent has been obtained by putting the person…in fear of death or hurt”. 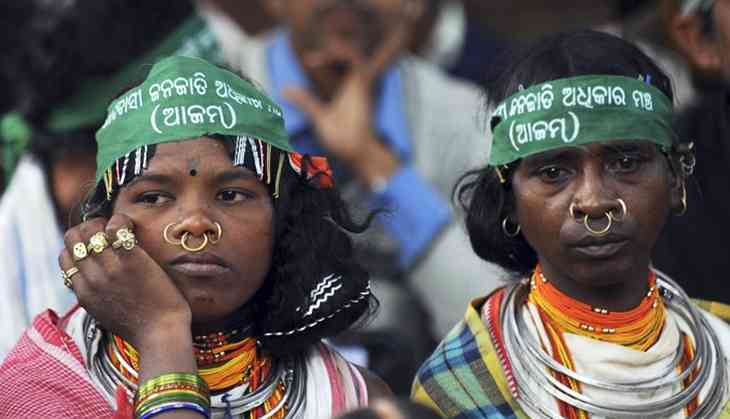 While hearing a case, on 9 May this year, the National Commission for Scheduled Tribes instructed the Raigarh local administration to take action under the Act in the cases where Adivasi land was transferred to other people through forgery. The order was passed in the wake of allegations that over 300 acres (121 hectares) of Adivasi land had been unlawfully transferred to non-Adivasis in Kunkuni village, Raigarh between 2009 and 2015. “The National Commission for Scheduled Tribes (NCST) has instructed the District Magistrate of Raigarh in Chhattisgarh to provide the current status of action taken against the indulging officers and employees found accused in the illegal land transfer cases,” noted a press release sent out by the Ministry of Tribal Affairs, Government of India. “With provisions of the SC-ST PoA Act in place we hope our plea will be heard and the matters investigated. That’s why we have opted for mass filing of the complaint. This just beginning,” Chouhan added. Chouhan told Catch that, their complaints have accepted by the police but the police have refused to register First Information Reports (FIR) as of now, saying they would first conduct a preliminary enquiry to determine the nature of the cases. Veerendra Sharma, Deputy Superintendent of Police, SC-ST Cell, Raigarh could not be reached for his comments. Meanwhile, Amnesty International India in a statement has said, “Chhattisgarh must investigate allegations of dispossession of Adivasi land through coercion, cheating”.